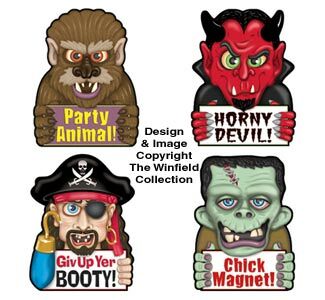 COST SAVING SET of 4 Of Our Popular Halloween Car Magnets. Make a fun statement! Add some slightly scary or spooky holiday fun! These unique car magnets with its colorful airbrushed look will surely be noticed wherever you drive! Made from quality outdoor UV & fade resistant materials. Over 7" long.